The International Institute of Tropical Agriculture (IITA) and Pennsylvania State University, USA, have collaborated to develop and launch Nuru, an Artificially Intelligent Assistant. 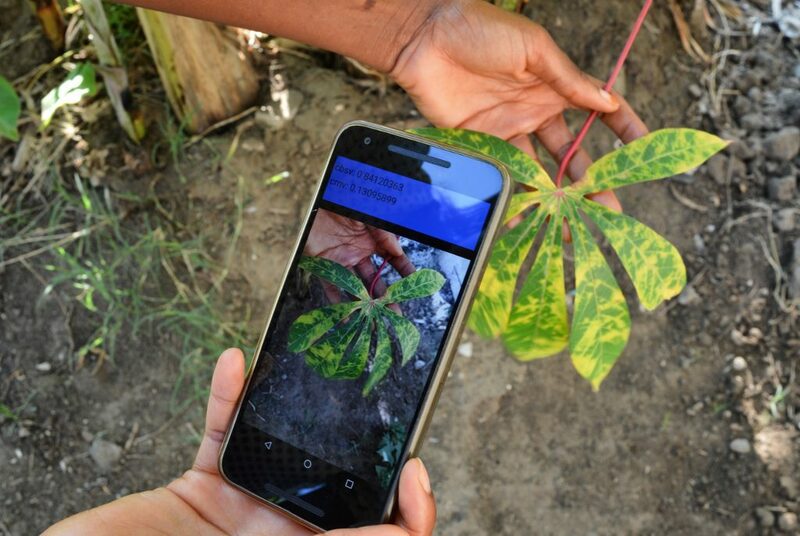 Nuru (Swahili for light) uses machine learning to accurately recognize leaves damaged by two important viral diseases of cassava (Cassava Mosaic Disease and Cassava Brown Streak Disease) as well as damage by red and green mites. Viral diseases are a major problem in cassava production in Africa and reduce the yields that farmers can achieve. “It’s hard for farmers to get information about their cassava crops, and particularly difficult to get identifications for virus diseases. Nuru can help to overcome both of these challenges as both information about cassava diseases and the capability to diagnose them can be accessed by any farmer or extension officer with a smartphone,” said James Legg, IITA plant health specialist who leads the research on cassava diseases in IITA. Nuru uses a convolutional neural network to analyze visual imagery and runs inside a standard Android phone offline. The tool is available in PlantVillage https://plantvillage.psu.edu/ at https://play.google.com/store/apps/details?id=plantvillage.nuru. It is a free app built at Penn State with support from the CGIAR INSPIRE Prize of the BigData Platform. The app can also diagnose the damage of the devastating invasive caterpillar pest–fall armyworm (FAW) on maize which is helpful as farmers often grow maize and cassava together. She can speak Swahili, French, English and Twi and is learning new languages all the time. Nuru will also help farmers to scout their fields to work out how many plants are affected. She will automatically calculate the incidence of cassava diseases in the fields visited. In addition, farmers can upload images of any crops to the cloud where a more powerful network works alongside humans to provide a rapid diagnosis. The data collected will be aggregated from across the African continent into a database to better understand the epidemiology of cassava virus diseases. This will greatly help decision-makers to target resources more effectively. Although Nuru’s cassava AI has been developed with IITA in Africa, collaboration with the International Centre for Tropical Agriculture (CIAT) will allow it to be adapted to monitoring the rapidly spreading pandemic of CMD in Southeast Asia. IITA, CIAT and other CGIAR centers work together under the framework of the CGIAR Research Program on Roots, Tubers and Bananas (RTB). Nuru works offline, which is important where connection to the internet is not possible. When the user is connected to wifi the information flows into the dashboard platforms. Nuru also offers advice offline in the field and provides a way for farmers to connect, chat and share advice so that they can collectively find solutions to some of their most damaging pest and disease problems. “An important feature is that it is offline–the farmer can use it as much as they want to examine their field for damage. Nuru is an extension officer that is always there for farmers, in their fields.” said David Hughes, a professor of Entomology and Biology at Penn State, which led the development of the app together with IITA. Once farmers and workers check their crops for infections and upload the required data, Nuru gives advice so that the farmers can take action to manage the situation. Work by IITA has shown the importance of phytosanitaton measures where farmers use recommended practices such as planting virus-free material and resistant varieties. Data will be validated by Africa-based focal points and transferred to a global web-based platform. It will then be analyzed to give a real-time overview of the situation with maps of cassava infection and measures that were most effective in reducing the losses that farmers experience. The mapping is especially important to track the spread of Cassava Brown Streak which is considered a major threat to cassava production in West Africa.